We've Found the Best Pupus in Poipu! Keoki’s Paradise is a favorite among locals and visitors alike. They are known for their exotic tropical drinks, amazing atmosphere, friendly service with lots of aloha spirit, and delicious food (of course). On a recent dining experience at Keoki’s Paradise a co-worker ordered the Prime Rib Bones from the Bamboo Bar menu. The following day her top priority mission was to have those ribs again or she would die (so she said). We waited all day long but were finally able to enjoy the tender, mouth watering, goodness. For $6 you get a pair of Prime Rib Bones. They are slow baked in the oven then smothered in a semi-sweet house made BBQ sauce. The result is the perfect combination of tender, juicy meat with just the right amount of flavorful BBQ sauce. Order it as an appetizer or pair it with some fries and eat it as a main dish. There are a few small catch​es​ - ​First, they may not always be available. The available stock depends on the previous prime rib orders. 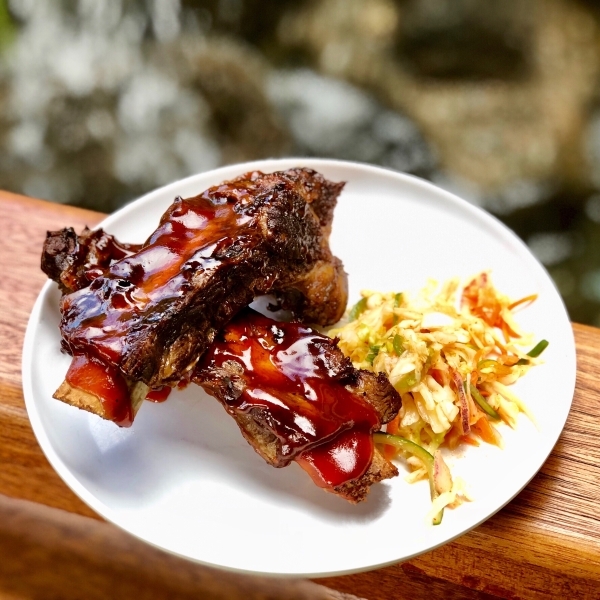 Second, you can only order them during​ Keoki's​ Aloha Hour, 3-5 pm & 9:30-10:30 pm daily​ and lastly, you have to dine in to enjoy them (which is a plus anyway).